US President Donald Trump called Abe to congratulate him Sunday night, the Japanese Prime Minister’s office told CNN. 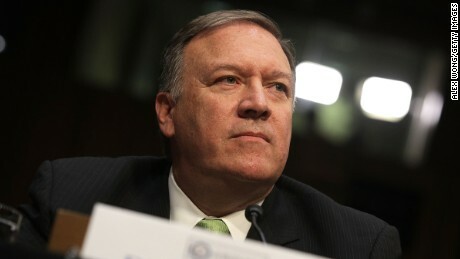 During the call, the two leaders spoke of being united on the need to increase pressure on North Korea, an official said. Japanese Prime Minister Shinzo Abe delivers a speech in Tokyo on Saturday night ahead of election day. Earlier this year, in the face of an increasingly hostile North Korea, Abe set a deadline of 2020 to revise Japan’s constitution, which contains language that bans the country from maintaining armed forces. It is a controversial proposal that strikes at the heart of the country’s post-war identity. 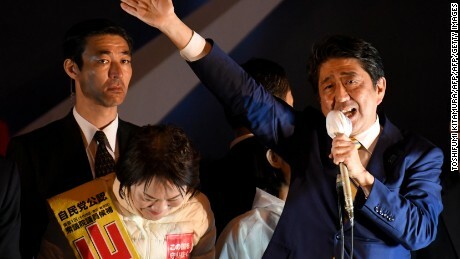 Abe called the election in order to secure a two-thirds “super majority” in Parliament, which will help him achieve his goal of amending the constitution. An exit poll by public broadcaster NHK forecast a decisive win for Abe’s coalition, saying his conservative Liberal Democratic Party (LDP) would take 253 to 300 of Parliament’s 465 seats. The Komeito party is predicted to take 27 to 36 seats. Official results are still to be released after Typhoon Lan prevented some people from voting in parts of the country, particularly those on outlying islands. However, their votes aren’t expected to change the outcome. 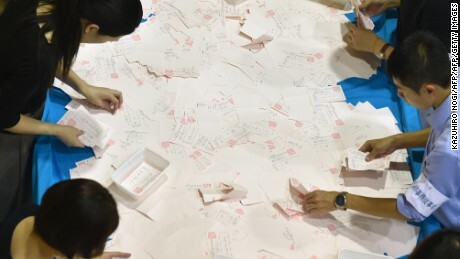 Japanese election officials in Tokyo count ballot papers for the vote on Sunday. Abe’s election call was highly tactical, coming at a time when the opposition was in disarray, and Abe’s personal popularity rating was beginning to pick up after months in the doldrums. The conservative Party of Hope launched by Tokyo governor Yuriko Koike splintered the traditional opposition but failed to make much of a dent in Abe’s victory. Koike did not herself run for a seat in Parliament as some had predicted she might, while her party failed to put forward a viable candidate. “I had expected Hope to serve as a rallying point to counter (Abe’s) continued predominance in power. Regrettably, the party has become a target of criticism instead,” she said, appearing at times to be on the verge of tears. Tokyo Governor Yuriko Koike on Sunday in Paris. “She initially thought she had a real chance of becoming prime minister by launching her party and taking over the Democratic Party,” he said, referring to the traditional opposition force in Japanese politics that split into Koike’s party and the left-wing Constitutional Democratic party (CDP). Nakano said a “purge” of more liberal members from the Party of Hope’s rolls left it with few credible candidates and hurt Koike’s standing with some former Democrat voters. “The problem is that Koike is not really an opposition politician,” he added, pointing to her history in Abe’s LDP. State broadcaster NHK put CDP’s seat count on 54 — compared to just 49 for Koike’s party — making it the largest opposition force in the Diet. 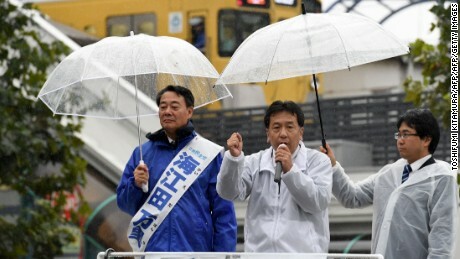 Yukio Edano, head of the Constitutional Democratic Party of Japan, rallies supporters in Tokyo on October 19. Japan has faced increased hostility from North Korea in recent months, as the rogue state locks horns with the Trump administration over Pyongyang’s missile and nuclear programs. Pyongyang flew two projectiles over Japan last month, including a ballistic missile, in act of defiance against Washington and the international community. Neighbors that suffered under Japanese occupation during World War II view Abe’s ambitions with concern and skepticism. It’s also highly controversial in Japan itself, to the point where lawmakers came to blows debating the issue in 2015. 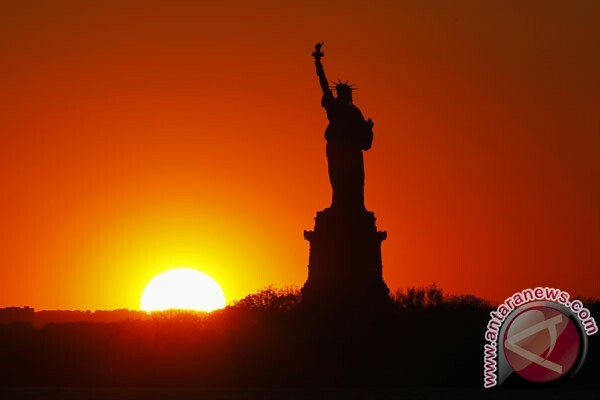 But altering Japan’s constitution is a heavy lift. Even with strong parliamentary support, such a measure must be approved in a referendum. One of the first items on Abe’s agenda will be US President Donald Trump’s first trip to Asia while in office early next month. Trump’s talk of turning inward has had US allies in the region worried that they can no longer rely on the US for defense as they once did. Some Japanese hawks have pointed to this as yet another impetus to revise the constitution. Abe has invested significant time and effort into his relationship with his new US counterpart, becoming the first foreign leader to meet with Trump when he was President-elect and during a summit in February at Trump’s Mar-a-Lago estate, where the two played golf together. Today, the two are bound by their shared hard line on Pyongyang — both have been vociferous in their opposition to North Korea’s missile and nuclear tests. Related Post "Japanese PM Hails Landslide Victory In Snap Election"